Greenville will send six representatives to the 55th Annual South Atlantic League All-Star Game. The group is headlined by players Carlos Asuaje, Jantzen Witte, Joe Gunkel, and Jake Romanski (pictured). Drive manager Darren Fenster and pitching coach Paul Abbott will serve as coaches for the All-Star squad. Asuaje and Witte meanwhile were selected as utility infielders for the South. Asuaje has seen time at second and third as well as left field. Asuaje's seven triples and 32 walks pace Greenville. An 11th-rounder in 2013, Asuaje ranks second on the Drive in batting average, runs, hits, doubles, home runs, RBI, and on-base percentage. Witte on the other hand is the Drive's statistical leader, pacing nearly every offensive category. His on-base percentage, batting average and slugging percentage lead not only the Drive, but also the South Atlantic league as a whole. Witte also leads the league with 45 runs scored and 23 doubles. 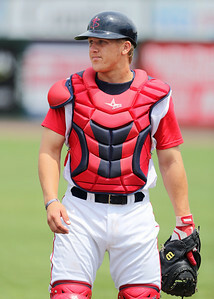 The 24th-round selection in 2013 was recently named SoxProspects.com Player of the Month. Gunkel, 22, is Greenville's only pitcher to earn the All-Star nod. Gunkel was moved into the starting rotation towards the end of May and the results have been impressive. As a starter Gunkel is 1-0 with a 3.60 ERA in three games, amassing 15 innings pitched. Out of the bullpen, Gunkel was that much more impressive. In 24 innings spanning 12 games, the 2013 18th-rounder pitched himself to a 1-0 record with a 1.50 ERA while striking out 33 batters and walking only five. Fenster is in his first season as the Drive's manager after serving as the team's hitting coach in 2012 and manager of the GCL Red Sox in 2013. Abbott has spent the last two seasons as Greenville's pitching coach and 2011 in the same role for the Lowell Spinners.